they fought pirates, the movie ends​ with them launching in to space. I originally thought I could duplicate my answer from Cartoon/anime about a giant robotic fish in the sky and then dismissed it because the main character's name was Joshua and there were no space launch that I knew of... 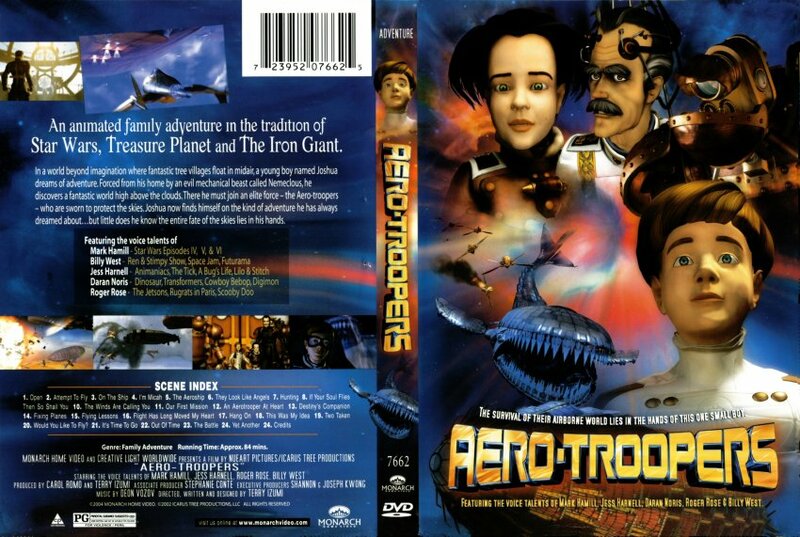 But upon further Googling, aero troopers ending returned this review, and it clarified the missing points. In a world beyond imagination where fantastic tree villages float in mid air, a young boy named Joshua dreams of adventure. Forced from his home by an evil mechanical beast called Nemeclous, he discovers a fantastic world high above the clouds. There he must join an elite force - the Aero-troopers - who are sworn to protect the skies. Joshua now finds himself on the kind of adventure he has always dreamed about... but little does he know the entire fate of the skies lies in his hands. Joshua gains a roommate and sidekick, Micah, a sarcastic and spunky cliche who is nonetheless something of a burst of personality in this otherwise rather dull movie. Micah and Joshua share an age and a backstory, and it’s not long before they’re playing around like fools on the ship’s guns, seemingly without any sort of supervision, and naturally it is here that Nemeclous’s little aircraft minions show up to be blown away. It has the wingsuits, as well as some pirates. On the bright side, along with the material wings he uses to hover and fly around, Joshua gets a gun! [...] The reason? Pirates have stolen the Aero-troopers’ supplies, we are told, and the “heroes” want to steal them back. Not the answer you're looking for? Browse other questions tagged story-identification movie anime or ask your own question. Anime movie: decayed futuristic world, dragons made of vines!